Americans love drama and there's nothing like what the Germany-USA match has to offer, plus the simultaneous Ghana-Portugal match. For those of you that thought our Ghana-World Cup nightmares had been exorcised, think again. 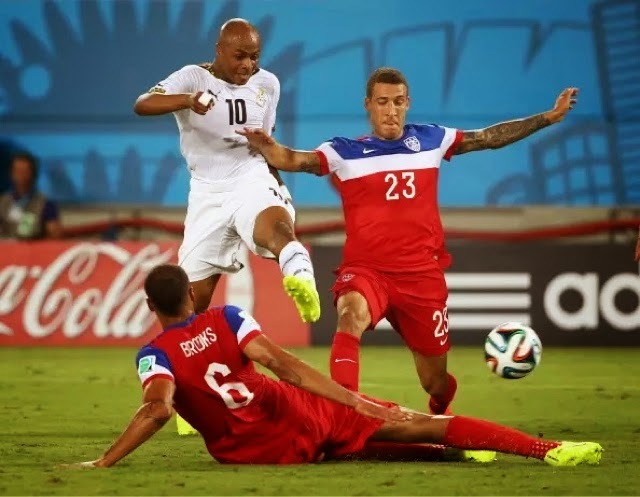 There is still a way that Ghana can go through and oust the Americans in the process. It's simple. USA wins and they're through. USA ties and they're through. But it's never simple at the World Cup. With Germany at 4 points and +4 goal differential, it will take a monumental takedown by Team USA to knock the three-times champions out. That, coupled with another goal-fest by Ghana. Highly unlikely but this tournament has been odd. If Portugal manages to take down Ghana by 3 goals and USA also loses by 3 then Cristiano Ronaldo and company go through and the megastar lives another day. Fact. To date, every single team that has played in Manaus has gone on to lose their following match. That would mean that both Portugal and USA will come out with zero points from their final Group G games. The Ghanaians are no pushovers. They controlled the game versus the Americans and probably deserved better. They showed why in the second game against the Germans. They almost won that game and it set up a nightmare scenario for their now-eternal World Cup nemesis: USA. If Ghana wins by two goals and USA loses by one goal the Africans will go through. Plain math. It would be a heartbreak for a hard-working American team and the third time they knocked the USMNT out of the World Cup. First it was directly with a win in group play, second was in the round of 16. This time via math.